With just over a month to go, Banchory Boys 2005 are preparing for a 2.5km race at Balmoral Castle on Saturday April 27 as part of the annual Run Balmoral festival, where up to 10,000 are expected. The boys, aged 13-14, will be competing in the secondary schools category in order to raise funds for an international football tournament in Barcelona in 2020. 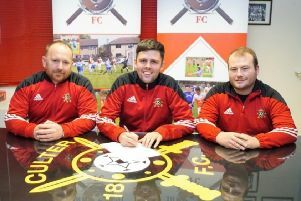 “It will be a fantastic opportunity for our young lads to experience another culture, develop confidence and learn new skills, but for many the cost is prohibitive, so we are doing all we can to raise funds,” said head coach Paul Law. The club are appealing to local companies who might be interested in sponsoring the team in some way, in return for publicity, whether it be sponsorship of the team’s training kit with logo, or by donations to their auction, which is due to take place on May 17 at the British Legion.